Taipei, Taiwan. – April 16, 2018 – MSI, a world leader in computer hardware, continues to innovate its workstation line with the Vortex W25 and updated WT75, WS63 and WE series of mobile workstations. The Vortex W25 is the world's first 2.5L desktop powered by NVIDIA’s Quadro P5200 GPU. The Vortex W25 is one of the smallest and most capable workstations on the market. MSI first created the chassis for powerful gaming performance with the Vortex G25, but we believe the innovative design will translate easily to those who need desktop-grade power in a small form factor. At the new product launch press conference held in Apr 14, 2018 at Beijing, Sandeep Gupte, Senior Director for Professional Graphics Business at NVIDIA, was impressed by MSI's technology to build a series of thin and powerful workstations. 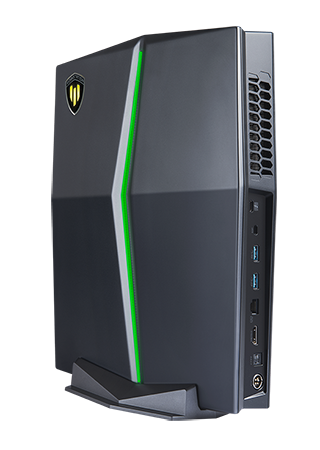 The Vortex W25 is the world's first 2.5L desktop powered by the NVIDIA Quadro P5200 GPU. In addition to its powerful graphics card, the Vortex also comes equipped with the latest Intel 8th generation processor. The new processor with its six cores of computing power, is up to 30 percent more powerful than the previous generation. The Quadro GPU provides up to 40 percent more performance than its predecessor. These performance upgrades make the Vortex W25 ideal for high-end 3D or VR tasks. The Vortex W25 is cooled by MSI’s excellent Cooler Boost Titan thermal solution to provide stability and ensure the best performance possible. The W25 with Quadro graphics performs with a greater thermal efficiency than the average Quadro DT. Additionally, MSI is expanding its ISV Certifications in 2018 with the additions of Autodesk Revit, ANSYS, Autodesk Moldflow, and Dassault Catia certifications. With its small size, the Vortex W25 hides easily in the office. It is VESA Mount supported, allowing the compact PC to be easily attached to the back of monitors to save desk space. It also features a rapid disassembly design for a fast and easy way to remove the top cover without the need for tools. The dual NVMe M.2 SSD by PCIe Gen3/SATA SSD Combo slots, 2.5” hard drive and dual DDR4-2400 slots are all easily accessible. The WE series has also been updated with the newest Intel 8th generation processors and NVIDIA Quadro GPUs. Additionally, the WE series will be available with Intel Xeon processors, a truly powerful processor that makes your workstation more durable for long-term use. It also now features a Windows Hello Certified fingerprint lock. The newest WT75 are powered by Intel's 8th generation Xeon desktop CPU for up to 50 percent better performance and NVIDIA’s Pascal generation of Quadro GPUs for up to 40 percent better performance. In addition to the performance upgrade, the new WT75 gains a Windows Hello Certified fingerprint lock and a smartcard reader. It also uses Intel Authenticate for hardware-enhanced identity protection. The WS63 is the perfect balance between performance and portability. With its updated Intel 8th generation processor and NVIDIA Quadro graphics, the new WS63 is up to 40 percent faster in CPU and GPU tasks. Its Cooler Boost Trinity thermal solution has also been redesigned to feature up to 20 percent better airflow than the previous generation. The updated WS63 also features a Windows Hello Certified fingerprint lock for biometric security. In addition to the fingerprint lock, the WS63 features Intel's vPro technology for enterprise-grade security management. The Vortex W25 is available now for $2,049 at Amazon, Best Buy and Newegg. The updated WT75, WS63 and WE series will be available later this summer.